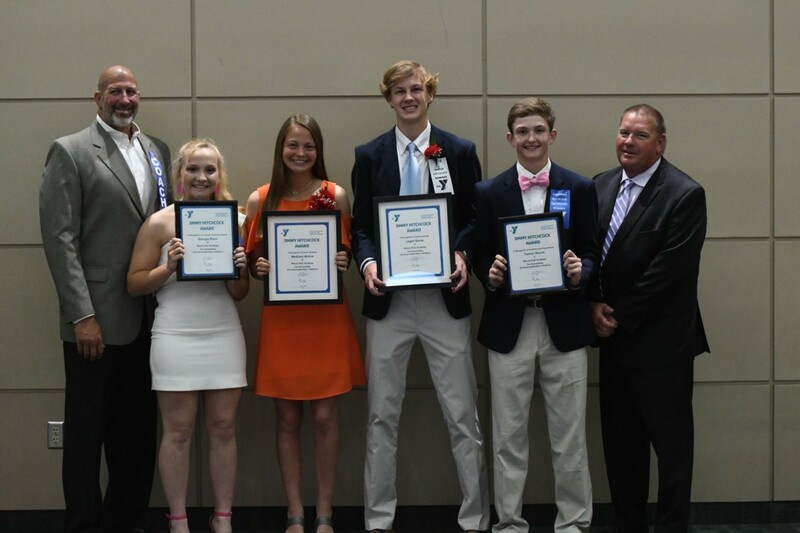 Recently, Macon East varsity basketball players were honored for their accomplishments on the basketball court. 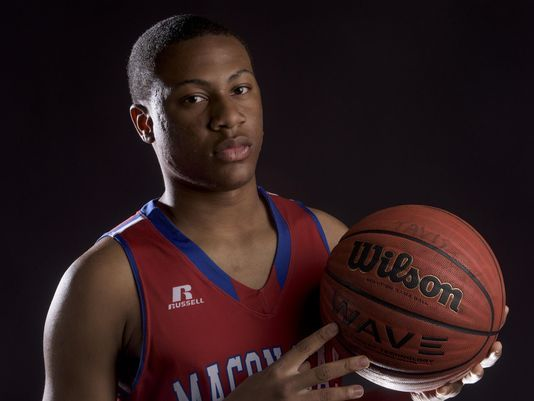 Four Macon East varsity boys were named to the AISA All-Metro Basketball team. Logan Goree and Mike Murry were named to the 1st team. Mike was also a finalist for AISA player of the year averaging 15.7 points a game with a season high of 31 against AAA Champion Tuscaloosa Academy. Logan was named to 2nd team all-state with an average of 15.1 points and 8.6 rebounds per game. He had 13 double-doubles and a season high 27 points twice this year. Kyle Edwards was named to 2nd team, while Brock Taunton received honorable mention. Overcoming a pre-season wrist injury, Kyle put up 9.5 points per game with 4.4 assists. At point guard, he had a 3-to-1 assist-to-turnover rate. Coach Larry Chapman was named AISA Coach of the Year after leading the Knights to a repeat state championship and a 33-2 season. The Knights are 83-6 in Chapman’s 3 seasons as head coach. 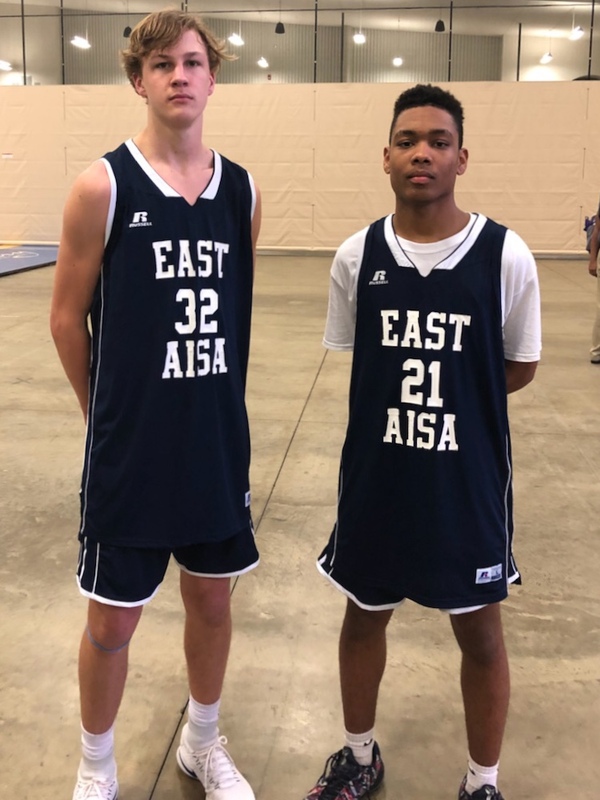 Macon East seniors, Logan Goree and Kyle Edwards were selected to play in this year’s AISA All-Star Basketball game. They helped lead the East team to a 93-74 win over the West in the All-Star game February 16th at the Montgomery Multiplex. Logan and Kyle have received numerous all-tournament and MVP awards throughout this year’s season, including all-tournament for Logan and tournament MVP for Kyle at the AISA AA State Tournament. At center and point guard this duo led the Knights squad on and off the court all season and brought home a 2nd state title for the Knights. Both Goree and Edwards are pursuing continuing their athletic careers at the collegiate level. 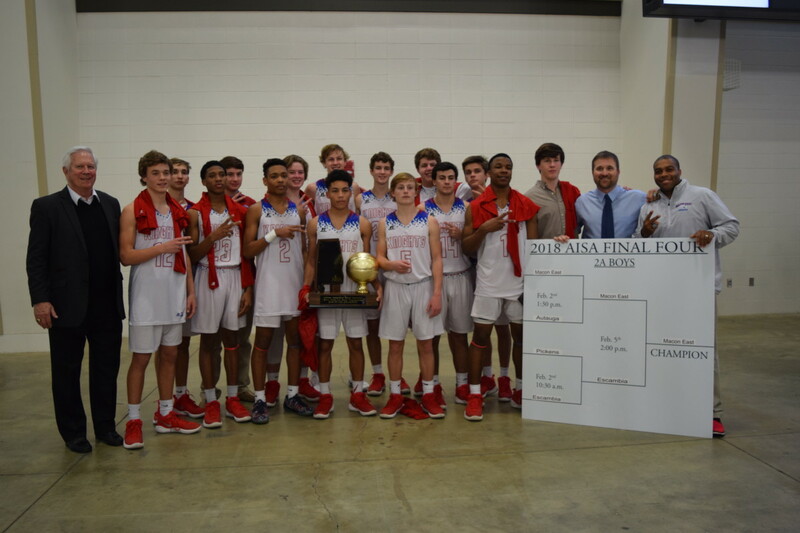 The varsity boys basketball team may have lost some key players from last year and 2 games early in the season, but they worked through it and came out on top again as the 2018 AISA AA State Champions bringing the coveted trophy back to Macon East. Senior point guard Kyle Edwards, senior center Logan Goree, and sophomore guard Mike Murry led the team all season with a flair that has become synonymous with Chapman’s basketball program. In the final game of the season, the Knights easily defeated Escambia 67-40 in a 31 game winning streak. 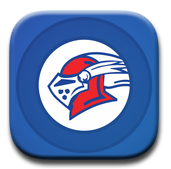 Macon East has won 66 of 68 basketball games in last year’s undefeated run and this year’s 33-2 season. With 27 points in the championship game, Goree was named to the all-tournament team and the AISA all-star team. Edwards, known by the coaches as the “Little Magician,” took home MVP honors and a spot on the all-star team with 12 points and his ability to control the Knights offense and flow of the game. Murry rounded out the all-tournament team with 13 points. The Knights will lose 3 seniors in 2018 including Tyler Watson, Logan Goree, and Kyle Edwards. With a line up of juniors and a sophomore bench who got substantial time on the court this season, the Knights varsity squad promises to be a contender for the title in 2019. 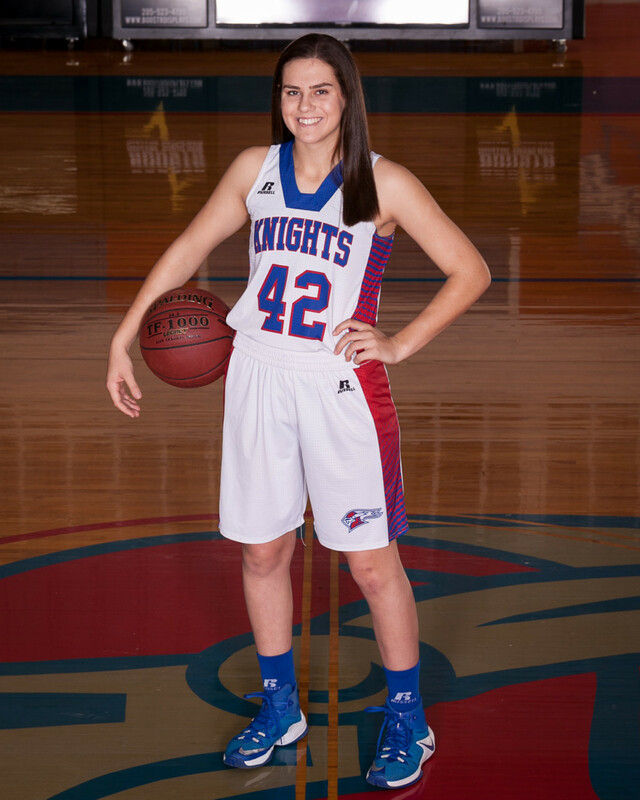 Macon East junior, Madisyn Kennedy surpassed 1,000 career points this season for the Lady Knights basketball team. An all star athlete in volleyball, basketball, and softball, Madisyn always gives 100% when it comes to sports and academics. 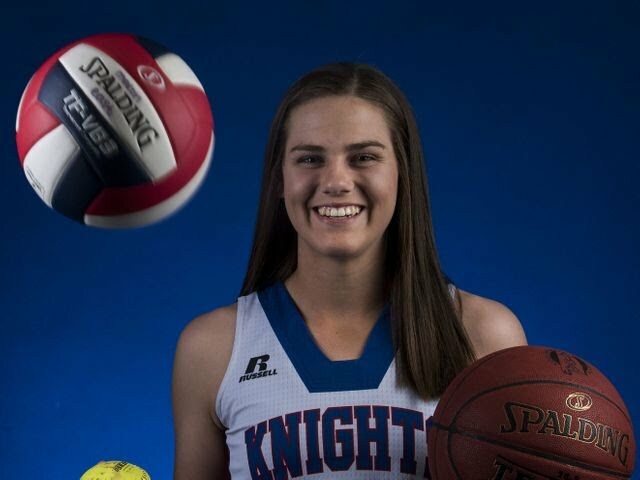 Madisyn is committed to join the Mississippi State Bulldogs softball team in the fall of 2019, but will continue to lead the Lady Knights athletic program for one more year. Congratulations Madisyn on setting an outstanding career benchmark! 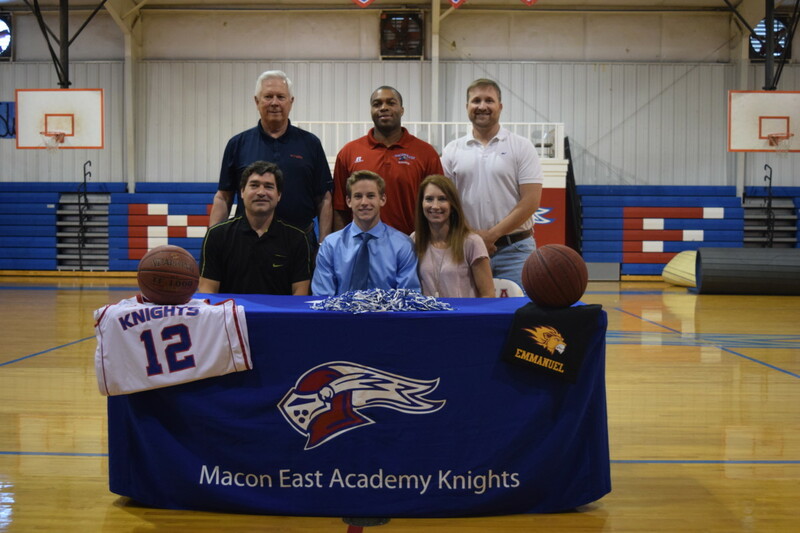 Macon East basketball player Christian Lewis signed to play next year at Emmanuel College in Franklin Springs, Georgia. Lewis transferred to Macon East from Chelsea High School his junior year to play under Knights head coach and Lewis’s grandfather, Larry Chapman. In his two years at Macon East Christian was a starter on the 2016 AISA AA State Runner-up team and the 2017 AISA AA State Championship team. Christian also represented Macon East on the AISA All-Star team. Christian received both academic and athletic scholarships at Emmanuel. 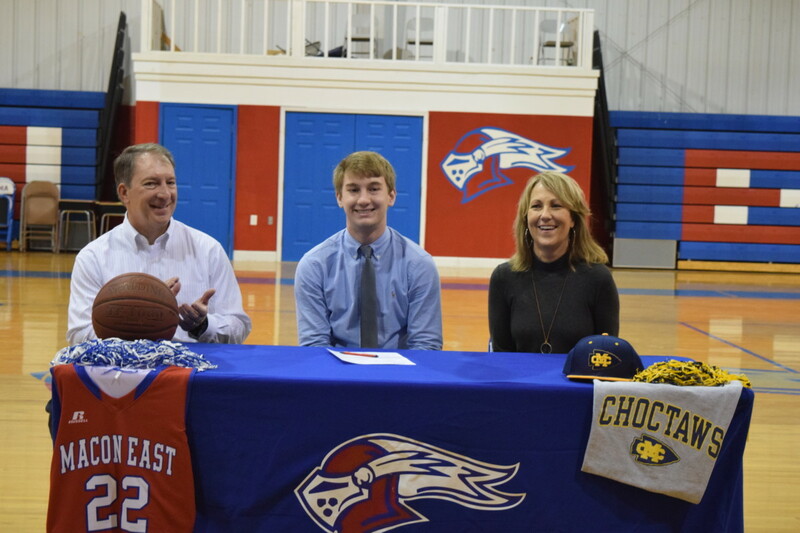 Macon East Academy basketball player Slate Garmany signed to play next season with Mississippi College in Clinton, MS. Slate transferred to Macon East from Oak Mountain High School in 2015 to play under Coach Larry Chapman. At point guard, Slate became the key to the Knights offense. In his two years at Macon East, Slate has been part of last year’s AISA 2A State Runner-up team and this year’s State Championship team. The Knights had a 33-0 perfect season ending with the state title they set out to win. Garmany was named to the AISA State All-Tournament team, AISA All-Star team, the All-Metro 1st team, and AISA State 2nd team. We congratulate Slate on signing with the Choctaws and receiving both academic and athletic scholarships. Artavious Billups was honored to be selected as the AISA Boys Basketball Player of the Year at a recent banquet. He became the first Macon East player to win a major state basketball award, but he hopes he’s just started a trend. Although Artavious was new to Macon East this year, the senior guard had a huge impact on the basketball program under the leadership of Coaches Larry Chapman and Lincoln Glass. Receiving all tournament nods and MVP honors at every tournament this season, including the state finals, Artavious led the Knights in scoring and represented Macon East in the AISA All-Star game and was named AISA All-Metro player of the year. The addition of Billups to the squad and his 18.5 points per game average definitely contributed to the Knights 33-0 perfect season. Artavious plans to continue his basketball career at the collegiate level but has not yet announced his plans. We congratulate Artavious on his selection as the AISA State Boys Basketball Player of the Year. 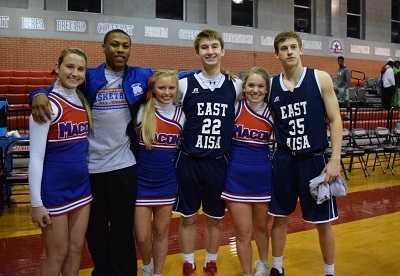 Following an amazing basketball season for both varsity basketball teams, Macon East was honored to have four athletes selected to play in the AISA All-Star games. MEA all-star, Sommer Sears and the Lady Knights took their season to the final four losing to Pickens Academy in the semi-finals game. The class AA state champion Knights had three representatives on the East all-star team: Artavious Billups, Slate Garmany, and Christian Lewis. The East squad defeated the West with ease in both games with scores of 91-69 for the girls and 120-92 for the boys. 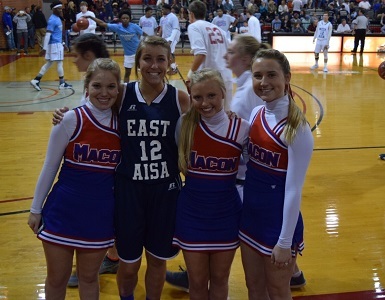 It was exciting to see these seniors in action one last time and cheering them on from the sidelines were Macon East’s AISA all-star cheerleaders: Rebecca Chapman, Rai Pritchett, and Alex Wyrosdick.